Activating Windows 7 installation is in a way registering Windows 7 operating system of yours and making it legal. Since Microsoft is keeping their rights on their various products including Windows products using the genius activation method, as a Windows 7 user, you should also activate Windows 7 copy of your own within a given period using one of different methods. Microsoft operating systems had this feature on Windows Vista editions as well as on Windows 7 editions with different Windows 7 Build 's until its RTM release is published. Also you may not be able to update your system with the recent product updates from Microsoft. So to make sure that you can benefit from all the features and enhancements of your Microsoft Windows 7 operating system, give priority to activate Windows7 as early as possible. If you have already tried to activate Windows 7 copy, but failed and getting "This copy of Windows 7 is not genuine" warning then you can refer to Windows 7 troubleshoot article Windows 7 Activation - This copy of Windows 7 is not genuine for possible solution suggestions. Let's continue with Windows 7 activate process steps. How to Activate Windows 7 manually? If you did not activate Windows 7 during your Windows 7 installation, you can start activating Windows 7 manually. You can see for Windows 7 activation you have limited time to complete activating Windows 7 installation. You can see how much time remaining for you to activate Windows7 for different Windows 7 Build numbers when you open the System control panel screen at the bottom of the panel view. To open the below System Control Panel screen, you can open the Control Panel, then select System and Security menu item and select the System control panel view. 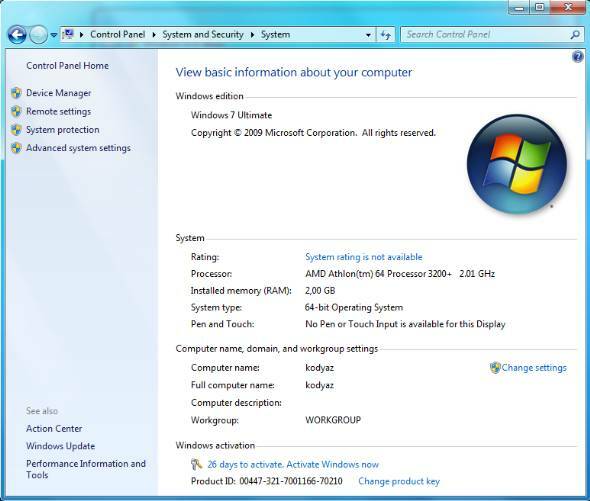 If you have not activated Windows 7 Ultimate Edition after you have installed your Windows 7 operating system, you will see the Windows activation section at the bottom of the Control Panel screen. When you have an online internet connection, you can start activating Windows process manually by clicking the "Activate Windows now" link. 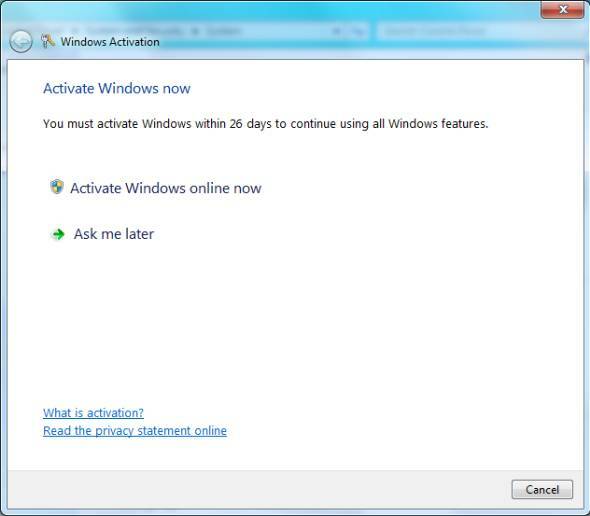 On the Windows Activation screen in order to activate Windows 7 Build 7000 for instance, you are reminded how many days are there still for activating Windows 7 Ultimate RC operating system. Activating Windows 7 will enable you to use all Windows features after the activation period is ended. 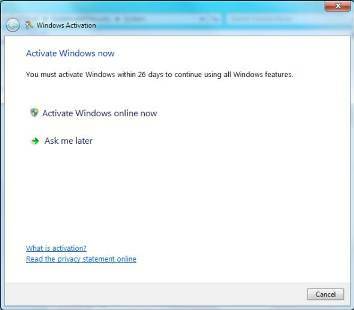 So to make sure, if you have an active online internet connection, go on for next steps by selecting the option "Activate Windows online now". This screen displays the message to the user about the product key that is being verified. So if the activation can connect to Microsoft via internet connection and manages to validate the product key without any problem you will be redirected to the last screen of the Windows Activation wizard. This is the activation step the question of "How to register Windows 7" is answered. If the system cannot reach to the internet due to network errors or a valid internet connection, you will be prompted to define and build an internet connection. 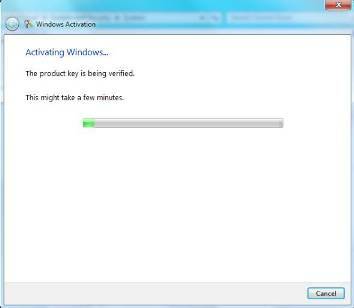 In the below screen Windows 7 users can see the result of a successful Windows activation. It is stated that your copy of Windows is verified and with a valid copy of Windows 7, you are eligible to receive all available updates and product support from Microsoft. As you can see in the above explained steps Windows 7 activation is simple and straight-forward unless you have a valid copy of Windows 7. Generally you will not face a problem during Windows 7 activation of your Windows copy. If you experience a problem while trying to register Windows 7 via activation, then you can call the Microsoft Support phones or start activation using phone procedure and talk to a support engineer to help you with your Windows 7 activation problem.